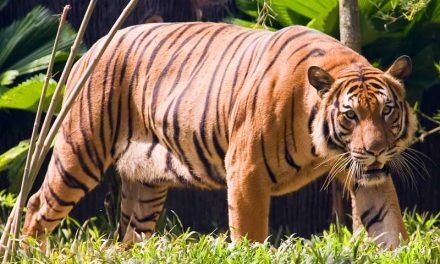 The Sumatran tiger, the rarest and smallest subspecies of all living tigers, faces a serious problem of survival in a condition full of threats. 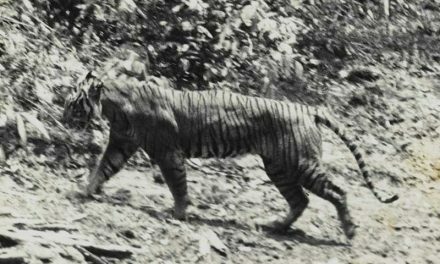 Despite this, it is the only species that survives in one of the islands of South Asia, as both the Bali tiger and the Javan tiger are already extinct. 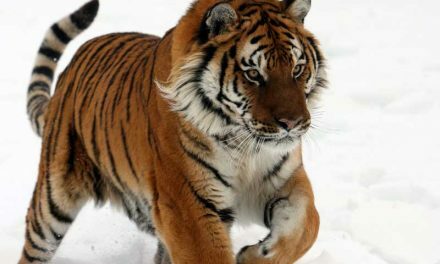 It is the smallest tiger subspecies, and features a thick dark orange coat with thick black stripes that fade as they are closer to the edges; It has the darkest fur and with more density of lines compared to the other tigers. The males have a thick and striking hair around the neck. Males measure between 87 and 98 inches in length and weigh 220-309 pounds, while females measure 85 to 91 inches in length and have a weight of 165 to 243 lbs. The Sumatran tiger can be considered a survivor. It is distributed only on the island of Sumatra, which belongs to Indonesia. The populations inhabit in isolated patches of the sea-level forests of the Bukit Barisan Selatan National Park to the mountain forests of Gunung Leuser National Park in a diversity of habitats. The total population of Sumatran tigers was 400-500 according to the first and second national government Tiger action plans of 1994 and 2007. However, the numbers are not constant, and populations are presumed to be decreasing. 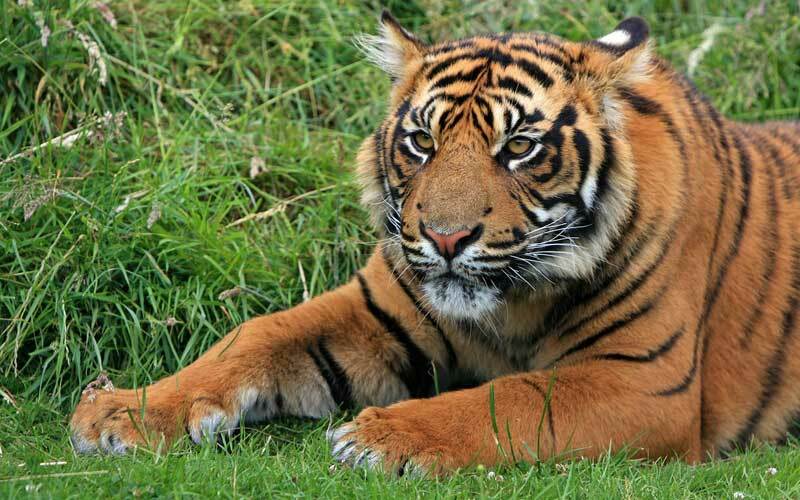 The Sumatran tiger is a carnivorous animal whose diet includes various species of deer and wild pigs. It may consume small prey such as birds and reptiles or larger prey such as rhinoceroses or elephant calves. In their diet, for those living in the Bukit Barisan Selatan National Park, up to 9 species of animals have been identified: Malaysian tapir, porcupine, great Argo, Southern Pig-tailed macaque, wild boar, greater mouse-deer, lesser mouse-deer or kanchil, the Indian muntjac and the sambar. Sumatran Tiger – Panthera tigris sumatrae. Specimens of this subspecies have a marked preference for dense vegetation habitats in the center of forests and avoid areas occupied by humans. For this reason, the incidence of tigers in the plantations of rubber and palm oil is very scarce. Their natural habitat includes high-altitude zones with low precipitations and with vegetation at ground level. Like all tigers, the Sumatran species is solitary and only makes contact with others during mating season, and in the case of females, while caring their offspring. Mating can occur at any time of the year. After a gestation period of approximately 103 days, the female gives birth to 2 or 3 cubs, which will be fed exclusively with breast milk during the following weeks. At two months of age, they begin to leave their den and gradually learn to hunt until they are completely independent. 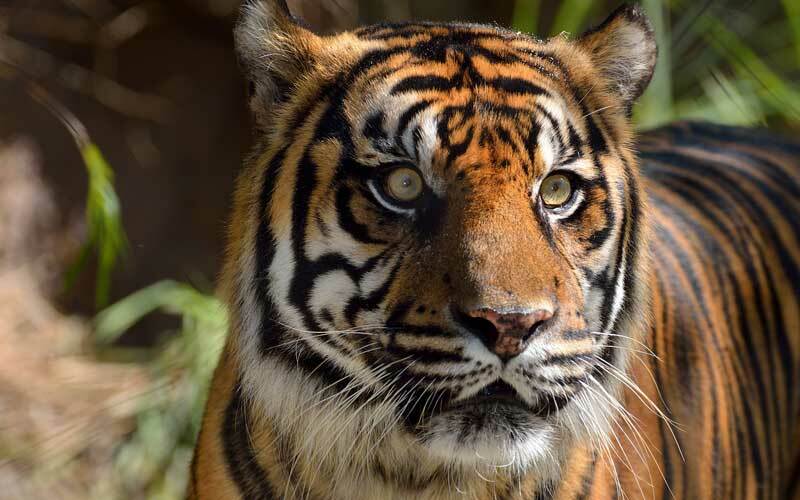 The Sumatran tiger has one of the most severe conditions for survival. It is classified as Critically Endangered in the Red List of the International Union for Conservation of Nature (IUCN). 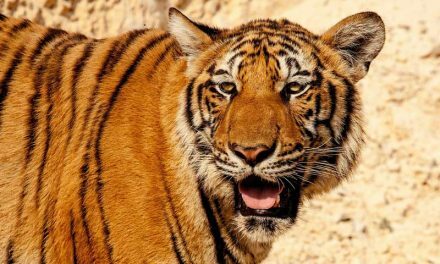 Its population is decreasing at an alarming rate, due to the loss and fragmentation of its habitat, the conflict between tigers and humans, poaching to trade parts of their body illegally or even to catch live specimens. Panthera tigris sumatrae is a subspecies protected by the Indonesian law with huge fines and imprisonment; In 1995 the Sumatran Tiger Project started with the aim of carrying out studies to find out information for an adequate management of wild populations. Other conservation strategies are in place, but it is still a long way before their populations grow again.